Panasonic SC-BTT590 review | What Hi-Fi? 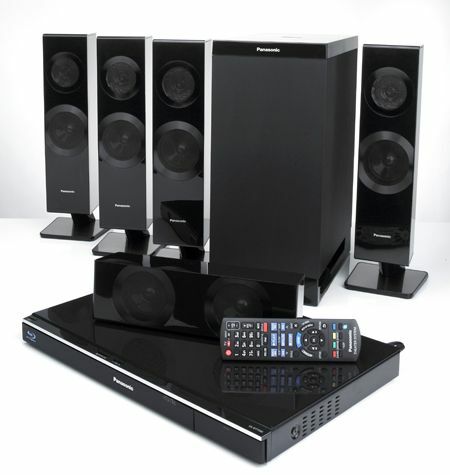 At around 40cm tall, this Panasonic SC-BTT590 system’s four slim satellite speakers, each complete with a little integrated stand, need a bit more room than some packages. However, with a tall, slim subwoofer and smaller centre channel completing the package they’re still reasonably easy to tuck away – and if you want, you can remove those bases and hang the centre, front and surround speakers on-wall using the keyhole cutouts provided. The manual even tells you how to create a failsafe system to stop the speakers dropping – perhaps with an eye to earthquakes – using 'string (not supplied)'! But whether you hang the speakers on walls or find space to accommodate them free-standing, it's worth the effort: although telling the best budget Blu-ray players and systems apart on picture is now quite a tough task, after comparative testing the Panasonic does stand out as a touch above the competition. Pictures have a greater sense of depth thanks to increased detail, there’s better texture to skin tones and subtlety to colours, and neither fast motion nor dark scenes cause the SC-BTT590 any problems. As we know from its TVs, Panasonic’s 3D pictures are highly competent too – stable and easy to watch,, with a good balance between the 3D experience and a realistic picture that hangs together well. The handover between speakers is smooth, making for a convincing surround sound. It’s a smooth sound, too, remaining controlled and easy to listen to even at high volume, and with a sense of refinement that’s not often found in systems such as these. The sub has a tendency to sound a little loose and unclear when pushed, but otherwise there’s little to argue with. And there’s plenty more to this system, with an integrated iPod dock that sits in a push-to-open drawer on the front of the main unit, an FM radio, and USB and SD card inputs. You’ll also find two HDMI inputs and an output, an optical digital audio input, analogue aux in and Ethernet connection for BD Live functionality, accessing internet content and streaming from a home network . In line with the design of the main unit, the remote control will be familiar to anyone who has used any Panasonic AV kit recently, albeit with the addition of the odd button – such as dedicated keys for Netflix and Skype. But if you’re after something more exciting, you can try the latest version of the free Panasonic Viera Remote app for Android and iOS devices. This gives you full control from your phone or tablet, and looks smart into the bargain – we like the retro rotary dial style controls. Simple but effective rather than showy in terms of design and performance, the Panasonic is a brilliant all-in-one Blu-ray system that will turn any TV into a cutting-edge home entertainment system.